What? I thought today was sunny. It was hazy this morning and cleared up in the afternoon. Only 3 amps around 11am but 7 amps by 3pm but that was after the scheduled port time. 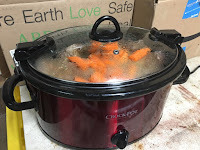 Interesting to think of solar powering a crock pot......at least you can eat your experiments. I also have only a large crockpot and do not find it useful for camping with just two people. I guess you could make huge portions and then have (lots of) leftovers, but if you try to make smaller portions, the cooking Temps are not right. I think you are right. Even at home the amount of food that you get from the crockpot produces too many leftovers. In many cases, the majority gets put into the freezer for later tossing (after I forget it's even there). I had not thought about the cooking temperature and process not working for smaller portions.